The day had finally come to leave Trinidad for our maiden voyage. We had finished all the pressing projects, had provisioned and were eager to get on our way. The final thing on our list was to check out. We planned to check out at 15:00, because if we were checked out by 16:00 we would avoid having to pay overtime to customs and immigration. That sounded good in theory and in spite of being at immigration at 15:00 and we were the only ones being checked out, it still took them exactly an hour, so we while we didn’t have to pay immigration anything extra, we had to pay overtime at customs. Let’s just say that they’re not the model for efficiency. I wonder if they split overtime income? When we were checked out we stopped by the duty-free shop and took advantage of great prices and bought a case of Carib, a bottle each of Kahlua, Stolichnaya, Tanqueray Gin, and 12 year old Angostura Rum. The plan was then to send a castaway email to everyone at home, grab a shower and say good-bye to Joe, before we cast off right before sunset. 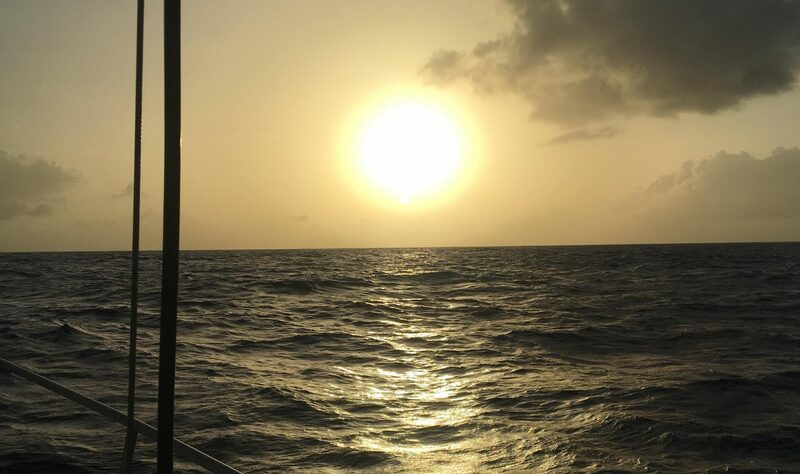 The reason we wanted to leave at night, was that leaving when it’s dark minimizes the chances of pirate attacks, because all the attacks on record happened in the daytime, within 30 nm of the Venezuelan coast. I hate leaving at night, so last second I changed the plan: we’d cast off at sunrise and hopefully be well off the coast by the time any bad guys woke up. So we got a good night sleep and woke up and were on our way by 05:30. The plan was to motor out and aim eastwards towards Tobago for at least an hour. Then turn towards Grenada and get as far north as we felt was necessary, before turning westwards. As soon as we got out of the Bocas and took aim at Tobago a heavy swell hit us. It wasn’t too bad, but it definitely slowed us down. After about an hour of slamming into the waves, we turned to 000 degrees and aimed straight at Grenada. The wind was a solid 15-20 knots and was very close hauled and to say that we were rolling is an understatement. The waves hitting us straight in the side hadn’t seen land since Africa, so they had a lot of fetch to gather momentum. I tried to fire up the watermaker, but for some reason it wouldn’t prime properly, so the process stopped every 5 minutes, forcing me to re-prime the pump with pressurized fresh water from the tanks. In the end I gave up, because I was spending almost the same amount of water priming the pump as I was making. Frustrating, but something I’ll look into when we get to Bonaire. Yes, we decided on Bonaire. The Watt & Sea unit, while very tempting is too expensive to justify the expenditure. It’s just not worth it to us, when we have such a solid charging regiment with 200 watts of solar panels, a D400 wind generator and a 6kw Yanmar generator on the main engine. We also agreed that we need to get to know the boat and our energy requirements better before we start making huge expenditures. This also meant that we could sail straight to Bonaire and could start enjoying our time on board and not only work. It was approximately 480 nautical miles to Bonaire from Chaguaramas (with the detour to avoid pirates) and I figured we would do around 5 knots (to be on the safe side) so it should take us around 4 days to get there. Back to us in the heavy waves with the bow aimed at Grenada. We hadn’t taken any seasickness medicines, but should have. I did OK, until I went below to hit the head. After 5 minutes I came sprinting out and fed the fish my breakfast. I didn’t go into fetal position after that, but both Margrethe and I spent most of the time horizontal on the cockpit benches, only getting up if really necessary and only going below if we absolutely had to. The watermaker not working and seasickness weren’t the only hiccups we experienced: On the first night, shortly after nightfall, the engine suddenly stopped and refused to start, even after I switched fuel filters. Luckily the wind was favourable, so we were able to sail without the engine, but it’s not a good feeling to be close to the Venezuelan coast, with only wind to depend on. In the back of my head I kept thinking about Peter (a Welsh sailor we met in Chaguaramas). He was boarded by pirates and held at gunpoint for a few hours while they ransacked his boat. He was sure they would kill him and the two other onboard with him. Why did the pirates manage to take them? … Because their engine wasn’t working properly, so they could only do 4 knots. Without an engine we would be an even easier target. We were doing quite well with the wind, so in the morning, I gave the engine another go and switched to the other fuel tank and another fuel filter and got the engine running again. All was good. It took almost 24 hours before we turned westwards and life onboard became much, much better. Seasickness left us and we were able to function like normal people onboard. With the wind coming in from 160-180 degrees from our starboard bow (almost straight from behind), with big following seas that pushed us along and on top of that we had a 2-3 knot current going with us, really giving us speed. We were flying and got to Bonaire a day faster than planned. In fact it only took us 3 days and two hours from mooring to mooring. The first 24 hours were rough, but the remaining 50 hours were much more pleasant and we both ate more (albeit not a lot) and were able to enjoy the trip. It really was a pleasant maiden voyage and it felt great to be out on the ocean again. A group of dolphins came by and said hello, and when that happens you know everything will be all right. Now we’re looking forward to a pleasant stay in Bonaire, with good food, great diving and some well deserved rest and relaxation. Congrats guys, great effort. First trips after being away from the ocean are always tough. You have to try the bbq ‘mountain’ chicken on Marie gallant if you sail past!! Stugeron is the best sea sickness med I’ve ever taken when its rough. You can merrily clean the bilge for hours with a couple of those in your belly ✌ safe travels keep the blogs coming!!! I need to get me a pack of those! Unfortunately we turned west towards Bonaire before we got to Marie Gallant, but will dig into the bbq mountain chicken when we return to the Caribbean in a few years!